This bowl contains every ingredient ingredients for a happy Monday, wine on the side. And what if I tell you that it can be done in one hour? Homemade pasta – in one hour – with not too much of a mess. And covered in garlicky, cheesy asparagus pesto. Are you feeling all the feels right now? I’m feeling every feel imaginable. I’ve decided that ricotta gnocchi is by far my favorite gnocchi. Not only is it so much lighter than potato gnocchi, it took me barely any time at all to make. Serioulsy! I was blown away. It was made so quickly that I’d even do this on a weeknight with no issue. And at this moment in my life, I want to make dinners that take approximately 45 seconds. So that says a lot. Let’s talk about how you need to try it! 1. tantruming. I did this bunch. I was such a joy. 2. whatever noodles my mom made, covered in a river of butter and tons of parmesan cheese. No really. I’m talking tons. 3. gnocchi. It was never homemade in our house, but I still enjoyed it and it was the one thing I’d actually have tomato sauce with. With my strong feelings on Thursday night dinner as a kid, it also meant that I had a lovely disdain for Italian resataurants. I KNOW. Are you wondering how I’m even human right now? However, we did have a few Italian Ovens that were only open for a handful of years, and I loved that place. I became closely acquainted with the stromboli and calzone. And pizza, obviously. But anyhoo, if we weren’t at an Italian Oven and we were at another place with Italian cuisine, gnocchi was my order choice. Simple and done. It was until my early twenties when I first had ricotta gnocchi – or gnudi, as it’s more frequently called – and very much enjoyed it. And it wasn’t until four or five years ago, when I had April Bloomfield’s gnudi at The Spotted Pig that I was like UM YES PLEASE NOW FOREVER give me nothing else for the rest of my life yes yes yes. Super light and fluffy. Covered in brown butter. Crave city. Ricotta gnocchi is the answer to all my whiney pasta prayers. Potato gnocchi itends to be so… heavy. I’ve made gnocchi with pumpkin and squash as well, and while it’s more delicious that traditional potato, it still doesn’t match up to the version with ricotta. Should we talk about the asparagus pesto? Maybe. It’s asparagus! Made into pesto! Think lots of garlic, cheese and olive oil. It’s heartier than a pesto made with herbs and it tastes exactly like spring. We have the teeeeeniest bit left in our fridge because I’ve been hoarding it like nobody’s business – it’s gone on toast with eggs, I ate it with pitas and hummus last Friday and I kind of marinated some chicken in it too. Eddie loved it. Max loved it. It’s been added to the pesto list for summer. Can I grow asparagus somehow? I should probably shut up and start with mint, I know. Because I can’t leave well enough alone, I topped this springtime hug-in-a-bowl off with the crunchiest of all the bacon. After a little spritz of lemon, a shaved parm shower and a glass of pinot gris on the side, the dinner game is majorly elevated. In a bowl, stir together the ricotta, 3/4 cup flour, cheese, eggs, salt and pepper until just combined – using a rubber spatula. Add the remaining flour 1 tablespoon at a time until the dough comes together, form a ball. Press it into a disk on a floured surface and cut it into four equal pieces. Take each piece and roll it into a log about 16 to 18 inches long. Cut 1-inch pieces with a sharp knife. To cook, bring a pot of salted water to a boil. Once it’s simmering, add the gnocchi and cook about 2 to 3 minutes, until it floats for about 30 seconds. Remove with a large slotted spoon or sieve to drain. Reserve about 1/2 cup of the pasta water. Bring a pot of water to a boil. Cut the asparagus spears into thirds. Take a handful of asparagus and set it off to the side – we will toss the spears and pieces in the pasta. Add the remaining pieces to the boiling water and cook until slightly tender but still bright green, about 5 to 6 minutes. Strain the asparagus. Heat a skillet over medium-low heat and add the bacon. Cook until completely crispy and the fat is rendered. Remove the bacon with a slotted spoon and place it on a paper towel to drain excess grease. Remove all but 1 tablespoon of the bacon fat from the skillet. Add the asparagus pieces that you set aside and toss. Cook for 2 to 3 minutes, until slightly tender. To serve the pasta, add it to the skillet with the asparagus. Toss the hot gnocchi with the pesto and a touch of pasta water – I only add about 1/4 cup first until I get the consistency I like. 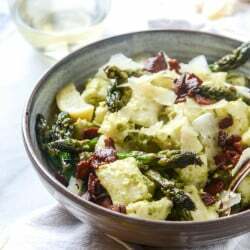 Add to a bowl with the asparagus pieces and spritz with lemon – then sprinkle the bacon overtop. Top with extra shaved parm. anything green is healthy in my book! Asparagus is actually super easy to grow. Just buy some crowns (you can start with seed but it will take about 3 years to produce edible asparagus), prepare a bed and plant them. They’ll come back with very little maintenance, every year in the Spring! I have a bed in my city backyard, a little south of you in DC. Unless it’s super dry they don’t even really need watering… very self sufficient. ah thank you!! i must do it. Oh my oh my, those pillowy gnocchi looks so good I can’t even! Never heard of ricotta gnocchi before, but it is now officially something we will have to make. We’ve also been on a huge not-basil pesto kick lately (spinach is our fave), so this asparagus one will be the next we make! Oh heavens, those gnocchi! And made in less than an hour?! Dying to try them! I made gnocchi once and my hands were sort of glued together until the bf came to rescue me – you make it look so easy! (Or did I just do something totally wrong) love this recipe, I will have to pin this for later. i had the same experience when using potatoes or squash! the ricotta definitely doesn’t do that, it’s much lighter! Done in an hour? Ugh. I hope so. I’m a little slow. I’m the gal who drive 10 miles UNDER the speed limit. But heck, it’s raining so making this today. I love the asparagus pesto idea!! And I completely agree – ricotta gnocchi is 1000% better than regular gnocchi! Fluffy pillows of heaven. O God I am drooling over here! This looks like perfection and gorgeous photos too! This is going to be incredible. I can’t wait to make it!!!!!!!! Tell me more about the “press it into a dish on a floured surface …” part please Jess!! You perfectly captured my feelings on pasta & Italian food growing up! I LOATHED spaghetti night at our house; like dump the meat sauce in the garbage while my mom wasn’t looking & strategically place other garbage on top. I didn’t have gnocchi for the first time until I was 22 in San Fransisco at the cutest Italian restaurant ever (deep, plush couches and fairy lights). I LOVED it. I will definitely be trying this recipe! Is it really as simple as that to make homemade gnocchi?! I’ve always been incredible intimidated by homemade pasta, but this is looking like a good place to start. We’re still having winter weather here in Chicago and I am craving spring foods! All the asparagus. All. The. time. as long as you use ricotta, it is! the kind with potato is a bit more labor intensive because you need to rice (or super puree) the potato. ugh why do Mondays NEVER get easier?! at least this gnocchi helps! you are so right – that would be an excellent veg option! So when I checked you blog this morning ( before my first cup of coffee) I almost died when I saw this. You are my favorite person on this planet right now. I know it’s good to taste but not looking so well. But it’s also good like your other previous shared recipes & Thanks again for continuing recipe sharing with us! I love the sound of that asparagus pesto! I’ve always been a bit intimidated by gnocchi but you make it sound so easy. Definitely want to give this a try! this one is way way way easier than potato! That asparagus pesto sounds dreamy! If nothing else, I need to make that!! :) Thank you for another great recipe. Anything under an hour, dying to try this. This looks like it would be the BEST way to eat pillows! Little pillows of heaven, yum! sharp knife is all you need! i swear. You had me at garlicky, cheesy asparagus pesto! And I love the ricotta gnocchi idea. I’ll definitely be making this this week! I hadn’t ever tried gnocchi until like a month ago, isn’t that the craziest thing?! I just tried the store bought version but this sounds so much better, I already have all the ingredients! Oh my, this dish looks like heaven on a plate. I have never made gnocchi but anything made with ricotta and I am full in. The asparagus pesto is an added bonus. On another note, I have a request./question. I sampled a Trader Joe’s “treat” the other day…Mac & Cheese balls. They were so yummy…creamy little crispy coated balls… but the fat/calorie count for one meager serving was crazy. I have been thinking about how to make a lighter homemade version and was wondering if you have any suggestions. Thanks! ooooooh i will have to work on that nancy!! Oh wow this looks so danm good!! sara! so glad you liked it! How crucial is measuring by weight instead of volume? And can you give a sense of what volume might be? For the ricotta, I mean. take a look at the source article she linked for the gnocchi recipe. weight is key because different brands of ricotta have different weights once they’re drained. yes i totally agree with stephanie, however i think if you ended up with about 1 cup of strained ricotta, it’s would be a good starting point. This looks scrumptious! I’ve had a similar gnudi experience at a restaurant in Chicago. Heavenly! Thanks, I look forward to your response !! i haven’t tried it, but i bet that you can. i’d probably start with the white whole wheat flour and maybe use a bit less than called for! This looks heavenly! I LOVE ricotta gnocchi! WOW…I can. not. wait. to. make. this. We just so happen to have a bunch of asparagus in our crisper right now…putting it on the menu for later in the week! Absolutely adore your blog! This looks aaaaamazing! What if I don’t have a scale for the ricotta? Can I use a cup instead? I liked the idea of asparagus pesto. I usually like multipurpose recipes which can be paired with a variety of other recipes. I liked the fact that you can use it as a marinate for chicken as well. And yes, homemade gnocchi is definitely best. I have the same question as Judy, I like to replace whole wheat flour in place of white flour in almost all my recipes. will the gnocchi be as fluffy as yours if I use Wheat flour?? There is still an Italian Oven in Connellsville (and it’s still delicious). Holy cow. I just made the gnocchi tonight (using cottage cheese instead of ricotta, b/c that’s what I had, and it is hands-down AMAZING. Couldn’t do the asparagus pesto this time (doing an intolerance discovery diet, so many things I can’t eat right now), but I’m sure that’ll be amazing, too! Oh I have got to try this! I make homemade ricotta a lot for stuffed shells but never knew it was so easy to make gnocchi. I made this recipe a few days ago and oh my goodness. Absolutely in love! And very happy to have a base recipe for ricotta gnocchi that I can actually make! My boyfriend, incredibly picky eater, couldn’t get enough of the asparagus pesto. Thank you! Love it!